We visited Philip Johnson’s Glass House on a chilly Friday morning in autumn. After multiple failed attempts to reserve a visit on the Philip Johnson Organization’s website, we finally managed to secure spots on a tour two weeks in advance. We hopped in a borrowed car and set off from Providence at 6:45 AM to arrive in New Canaan, Connecticut by 9:45. Once there, we were quickly ushered into a private tour bus, which ascended above the town’s center before descending down a narrow, winding driveway into the fabled compound. Besides our guide, an elegantly dressed middle-aged woman, we were joined by four other guests: a twenty-something-year-old English designer and two homeschooled fifth-graders accompanied by their Australian educator for their weekly excursion. We got off the bus and faced our main (and only) attraction ($25): a long rectangular glass box amidst idyllic rolling, green grounds. The Glass House sits on a compound of a dozen other structures designed and utilized by Johnson, including a private sculpture gallery, a library, and a greenhouse, which we could tour for an additional $60–$120. The Glass House is managed by the National Trust for Historic Preservation—a nonprofit whose mission is to preserve places that “tell the stories of all Americans” and inspire “broad public support”—though the ethos of our visit seemed to be: the more you pay, the more of Johnson’s life and work you get to see. As an example of work that has been praised for its aesthetic accomplishment for the past half century, the Glass House raises questions about the significance of art’s functionality, both in the sense of its form and its contribution to greater society. At a shocking 1,800 square feet for a single-room home, the Glass House is simple and elegant: a minimalist’s dream. Considering this house has not been inhabited since 2005, there were almost no personal belongings in sight. What we saw was similar to Johnson’s actual living space, given his uncluttered lifestyle. Despite the lack of objects, in a strange way, there was much to explore. Light from all angles flooded in through the floor-to-ceiling windows, which also serve as walls for the house. We took selfies with the vanity mirror in the semicircular bathroom studded with iridescent green tiles then imagined sitting on the leathery mid-century furniture set (no touching allowed). Inside the house, we were immersed in the 360-degree panorama of the snow-capped New England woods. We spent just over forty minutes in the Glass House, learning about the level of attention Johnson paid to the design of his creation, down to every joist and beam. To avoid glare on the glass at night from the reflection of outdoor lights, Johnson installed downward facing lights around the house’s perimeter. He always had staff present to watch over and maintain the pristine property. The guide described how the architect would stand at the edge of the house with binoculars to dictate to groundsmen over the phone which trees he wanted removed. Glass, which in most other architectural contexts denotes transparency, did not function here to allow others to peer in, as the compound is a gated private residence in the middle of the woods. Rather, the glass allowed for Johnson and whomever he invited over to gaze out onto the world, one-sidedly—a metaphor of the architect’s lifelong elitism. “His career mirrored American life of the postwar years, marked by increasing corporatization and the concentration of power and wealth among a privileged few,” the architecture critic Mark Lamster wrote in his biography of Johnson, The Man in the Glass House. 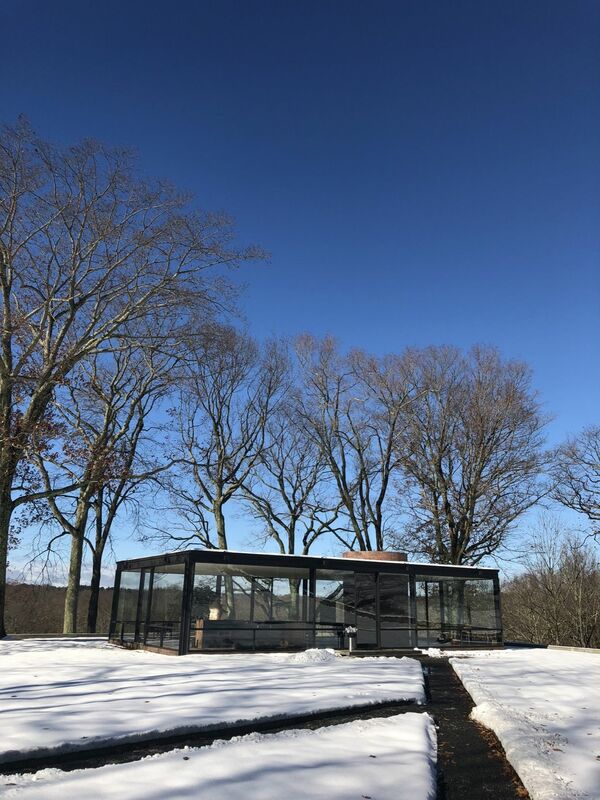 Interestingly, the first fact our guide told us was that Johnson was heavily inspired by—or perhaps ripped off entirely—Ludwig Mies Van Der Roes’ Farnsworth House, the similarly transparent, minimal structure designed a full two years before Johnson’s Glass House was. We were interested in Johnson’s politics and how they might have informed his work, including the Glass House. In his personal life, Johnson was said to present as openly gay or to the extent that one acceptably could during his lifetime, though his whiteness and expansive amounts of wealth insulated him from the prejudices most gay men faced. Johnson and David Whitney, the contemporary art curator and collector, began to live together peacefully in the Glass House in 1960; meanwhile, it was not until 1969 that the first brick was thrown at the Stonewall Inn, which many view as the beginning of the modern era for LGBTQ activism. Furthermore, his homosexuality did not preclude other prejudices; he was a known racist and Nazi sympathizer. As two people of color, we felt slight discomfort when our guide showed us photos of Johnson, Whitney, their friends, and their collaborators—creative powerhouses like Andy Warhol, Lou Reed, and Jasper Johns, all white men—sitting in the residence in suits. Even if we chose to ignore the faults of his practices and beliefs, his legacy exists in buildings that could not be so easily torn down. As Brown students, we pass under his creations everyday during our commutes around campus and find them integrated into our memories, not necessarily in a way that involves Johnson. He designed the List Art Center, a building that is controversial for Visual Art students at the university for its lack of windows (and interesting for us in its contrast to the Glass House), as well as the University’s Computing Lab, which housed the most complex computer on the East Coast at the time. It is significantly more aesthetically similar to the Glass House, with its prism-like, Modernist facade and a front covered completely in glass. Brown was also a significant part of Johnson’s life, given it was where he met Whitney. Thirty-four years his junior, the then-RISD student attended Johnson’s lecture at Brown in 1960, after which he introduced himself to the architect. A week following that, Johnson invited Whitney to New Canaan for a personal tour of the Glass House. Their relationship began shortly after and lasted their entire lives, until they both died in 2005 (in a place none other than the Glass House). Now, we walk around campus and try to synthesize our experience at the Glass House with the ways in which we view his creations at Brown. We can at least learn what an artist should not do from Johnson’s example. In a world marked by crisis, an artist should seek to be progressive and radical in their life practices and politics, just as they are in their work.The realms of the aesthetic and the ethical should not be viewed as separate, yet our everyday usage of architecture inevitably separates them, as we students enter and exit buildings for classes rarely properly contemplating their purposes and histories. Johnson’s presence on Brown’s campus is material, like it is at the Glass House, but at the same time forgotten and obscured. JACOB ALABAB-MOSER B‘20, ALEX WESTFALL B‘20 wish they were two homeschooled fifth-graders with weekly excursions.